Hi Pete here again, for those of you who don’t know me, I’m an amateur investor attempting to develop my techno-fundamentalist skills. This is really just my investment diary, and is not intended as investment advice. I hold a long position in many of the shares discussed. Spirax-Sarco Engineering (LON:SPX) - Poor old Spirax - only in for a week then out again on RS 1 year. The Russian finance company - it has had 6 days in the red last week, Friday had huge volatility, briefly dipping below the 50 day MA but bounced back. This is following the rest of the market this week - stalled. Quite positive how little interest there has been in selling Fevertree this today. Very low volume, tight range. One too look out for when conditions improve? I don’t cover this. Why do I bother writing this each week? I may as well write something! Ok here goes. Volume is reasonably high at the moment, but no real price movement. Latest addition to the portfolio - lost 2.5% today but pleased to see volume is lowest recently. I'm not a Minervini expert but maybe he has changed his strategy since that book was written which was about 4-5 years ago? Did he not say making lots of 10% gains is better than holding shares for a long time? Certainly recently he seems to be looking for short term gains. As I said US small cap is probably a UK mid cap, anyway seen few shares below $1bn. Yes you could have bought Amazon, Apple et al, when they were a small loss making companies. My point about EPS was growth, he's looking companies that are growing, so a positive EPS upgrade is something to look out for. Me neither and yes, I need to read the most recent book again too (Easter reading if I get a chance!). US Small Cap/UK Mid Cap - Well, with the DOW being something like 4x greater in value than the FTSE it's probably reasonable to say the majority of the stocks you mention would fit into <£500m equivalent Market Cap. EPS - Agreed, however, for me it's a fundamental that needs to be manually checked.  My technical first screen is really just an idea that they are very rarely incorrect. From my technical screen I would hope to pick up, from my notes (mostly documented here), my "manual" fundamental view - And then take it further should I wish. Yes it makes sense but I prefer the screen to do a lot of the work for me that's why I like the William O'Neil CAN-SLIM-esque screen, it only has a few new shares each week and it's quite demanding criteria, even then about half are rejected for various reasons such as Russian or mining/oil & gas companies. A screen that has 60 shares to start with means a lot of work to reduce it down to ones I might buy. Just a hunch, but I reckon that now that he has the capital, Minervini has moved to larger stocks so he can deploy bigger amounts in only a select few stocks and still make a good return. He also has thousands of followers and an alert service which means he probably needs liquidity. When starting out, I’m sure he rode a few small 100%+ runners to build his initial capital. Yes, I try and start with the technicals now (what’s the point finding a massively undervalued company if no-one else shares your opinion!?) and work backwards to the fundamentals. Despite always previously being the other way around. This has lead to good returns last year - although who didn’t make money in 2017!? Fundamentals still crucial though and help to calculate risk / reward effectively. For example, say a sluggish share suddenly announces 25% eps growth and is trading on a low PE of 10x, if you believe it’s sustainable, you can calculate 3 yrs downs the track that earnings may have doubled as well as the share rerated on a PE of say 20x. This equals a potential >400% upside in the share vs maybe a 20% downside if you are entering on a solid base (and ignoring any unforeseen profit warnings!). We all know that growth PE ratios can be significanty higher so there could even be further upside which again moves risk / reward in your favour. What’s worked well for me some far is buying out of a relatively flat base (like Future (LON:FUTR) last year) which seems low risk if the story has changed but can lead to large % gainers. Trouble with my current watchlist of shares is they have already run up quite significantly with the risk that they are overextended. Take K3 Capital for example - missed it midway through last year so do I i) wait for a retrace to a moving average to try and gainer a lower risk entry? ii) wait for the next base and try and buy it when it next breaks out ? iii) accept defeat on this one, move on and try and find the next K3?. Matylda- if your strategy is to buy on a retrace, you may want to pick up a copy of Jesse Stine’s book. His strategy is similar to o,neill / Minervini but for entries he looks for a retrace to a ‘magic line’ (don’t you just love the marketing spin!) which is a weekly moving average. His aim is to get a low risk entry (so you can risk more) into a growth stock which is different from the ‘cup / handle’ breakout strategy. I haven’t tested the retrace strategy yet, but need to do some historical chart reading to see how effective this would have been vs the ‘buy on breakout’ strategy. Was a great post thanks for sharing. I think I have to get away from the retrace though as I had the same problem with K3 Capital. FUTR - Another on my Watchlist at 320p at the moment, hence the rethink currently in progress. Soon as Nasdaq Composite goes under 200 dMA that’s a Bear market in my book —it’s very close ! Thank you Matylda for the link to your Minervini (MM) screen. To add a couple of thoughts. Noting Herbie's comment about your screen returning quite a lot of options. I have in my evolving Minervini (MM) screen some tests to incorporate MM's other two tenants - identifiable growth (e.g. earnings, profits, sales) and recent trading volumes (e.g. previous 10 days vs 3 months) - in addition to the momentum tests (like yours). Incorporating these has helped me to narrow options but importantly pointed me directly at stocks which are not simply trending on share price, but are also growing earnings (through revenues, and/or sales, and/or margins) as well as being recognised in the market (volumes). For example to capture EPS growth (this may not be my eventual test, I elected to use it as a first try to have a proxy for growth),a proxy (sales) for top-line revenue growth, and a proxy for profit growth (EBITDA) I use these tests. These are just initial trials at present and obviously if options appear on my screener I then investigate each one to understand the stock as well as interpreting the results against the test (for example a big volume change might be increased buys, it just as easily could be increased sells - but a chart view clarifies that for me). To encourage myself to keep very focussed I also test Quality Rank > 70 and Momentum Rank > 70. I put aside Value Rank (assessment of sensible purchase occurs when I examine the stock report and associated qualitative information). I also exclude Stock Rank Styles of - Contrarian (I might start to include these as my confidence/skills evolve), Falling Star, Value Trap, Sucker Stock. I also exclude Risk Rating - Highly Speculative. To keep me very focussed I also run the screen separately by market cap - Large only, Mid only, Small only & Micro only. I have found this to be a very insightful discipline. I hope you find a couple of these ideas of use. I enjoy your postings and interactions with others as they are often insightful and thought provoking. Results so far are a mixture but promising green shoots are definitely in evidence. But I have certainly invoked MM's rule (paraphrased) 'if a trade is going against you - exit 50% if it might be market volatility, but exit 100% if it persists, no matter what'. Plus a tighter refinement to this (to paraphrase) 'if after buying the stock fails to behave as you anticipated, exit - put you money elsewhere'. Finally, what I found of great value once I constructed the screen was to test existing holdings against it. That was thought provoking - not to be used as an automatic sell if too many tests failed (because in the end its a buy test screen), but certainly a good sanity checker. I have to also say that I have also found myself examining existing holdings too as I progress through the books, quite interesting that one. Just a note on the large selection front, I am actually OK 60 - 100 stocks or so. It does not take much time to rattle through them from a quick fundamental point of view, perhaps an hour or so to get rid of at least half of them. This is especially true as over the past 6 months I have pretty much covered the most recent trading statement or results for 90%+ of them. Ones discarded then do not change from a fundamental perceptive (at least in theory) until I again cover them when news is announced. I reckon the list may grow/shrink by 10% or so a week so that would be say a couple of new stocks a day max to analyse (after going through the initial list of course). Ab Dynamics (LON:ABDP) - This is something on my Watchlist already at 850p and now to be honest, I am thinking I should probably be considering a buy on a break above that 965p level. Active Energy (LON:AEG) - A new one to me and instantly I can see it's not making a profit (probably why it's a new one to me as I don't usually cover shares not making a profit). A quick check of the latest Interims (Sep-17) confirms its loss making with no mention of profitability. No need to update this analysis until the next update. Amiad Water Systems (LON:AFS) - Another new one to me which actually looks OK. Wondering how I missed the Interims in Sept (I believe I was on holiday) which actually look OK (Revenue up 6.2% to $55.7m, Gross margin improved to 39.6%, PBT up 93.9% to $3.2m and Fully Diluted EPS similar, up from $0.098 to $0.049. Net Debt $8.1m - FY expected to be in-line). However, it is a little strange that 2016 Revenue and EPS are down on 2015 and although both look set to increase this year by 50% or so (in 2017) it looks like both are set to be down again in 2018. The ROCE and Operating Margin are not exactly industry leading and there's still Net Debt about 20% of the current Market Cap. It's also an AIM listed Israel based company. So, I would be parking this one too until the next update. Just wanted to go through the above to see how my thinking is perhaps changing since starting on the books. I think the major thing for me will be having technical confirmation (trending up (as per the screen)) which I never considered a great deal before. In addition, I would probably not be waiting for pullbacks (although nicobos has mentioned Jesse Stine’s (thanks) which I will have a look at) any more which has cost me dearly in the past (not wanting to pay up!). All the best and thanks all for the welcome thoughts. "Just a hunch, but I reckon that now that he has the capital, Minervini has moved to larger stocks so he can deploy bigger amounts in only a select few stocks and still make a good return. He also has thousands of followers and an alert service which means he probably needs liquidity." You could be right, although I have followed him a bit on twitter and he does seem, even though he is most cash, to still be dealing in quite a few shares, I get the impression that he is doing many trades each day. He likes to invest large amounts so it does impact on the share price plus with his alerts and followers then it could well have an effect on the share price. Also read a few comments that his trading does not seem to tie up with what his books say. The cynic in me says that if he is making as much now from his books / alert service as his share trading, maybe he needs to keep ‘active’ in the markets to keep his audience interested and that involves making daily recommendations etc! In this age of sound bite media, he probably feels the constant need to tweet advice to maintain his legendary status. It would be rather boring if he only made a few suggestions each year (even if they were the only ones that matched all of his criteria!). As an aside, has anyone followed his tweets to see how his tips have performed recently? Or subscribed to his alert service? On his tweets he tends to only give out odd snippets, this week he did say his was still in 5 shares, so it's difficult to know how they are performing. Here is one: "TWTR is my biggest loser on the day, but I got out with less than a 1% loss on the trade. My biggest winners on the day include: $SHOP, $FND, $QDEL." As you can see from Shop share price you need to time your entry and exit well. Here is another one "99.9% of the time I shy away from low priced stocks, but this morning I added $HTGM to our Buy Alert list"
I take he means small cap. It is only about £72 mcap, maybe hit his stop loss if he was in more than a day. These must have been the shortest 'bear markets' ever! 12 months is hardly short—bear market can be anything from 6 months to 18 months or so. They are typically shorter than Bull markets-otherwise the stock market wouldn’t gradually go up over the long term. What do people think about Avon Rubber’s current price pattern? It reached a new 52 week high, very high volume on and up day, but today when it reached the 52 week high the volume was much lower. Perhaps a handle will develop? I’m interested in your interpretation. Of course, I could just wait 4 days and find out! "Perhaps a handle will develop?" It could well do. Looks like a textbook cup, lovely symmetry. Just my opinion. Ultimately the market will decide! 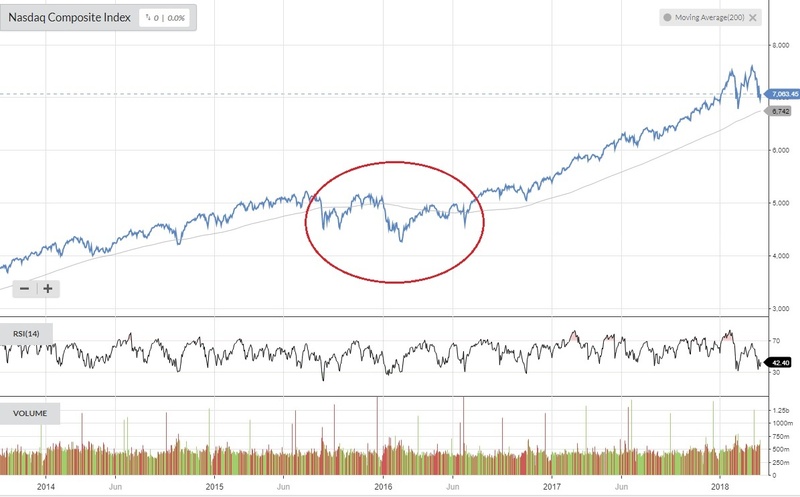 In the chart in post #40, the Nasdaq Composite was never more than a few months below the 200d moving average : these were neither 'bear markets' nor major 20%+ declines. If you wish to see a genuine bear market, check out the US 1929-1931 or the UK 1973-1974. Or the two-decade Japanese bear market of 1990-2009 ! With tight stops I found I was always quickly being stopped out, often on the market opening or MM's seemingly picking them off at random moments. Once you factor in the spread (especially on small caps) I found repeatedly losing positions was getting expensive. 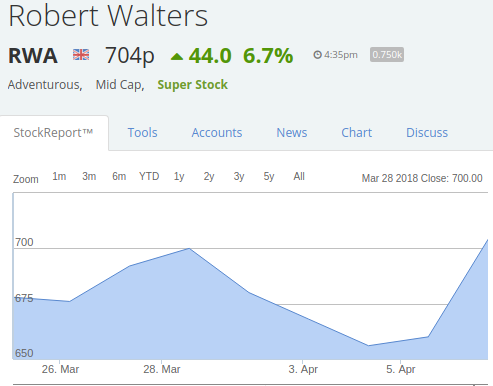 I see with Robert Walters (LON:RWA) it dipped to a tad below your stop and then immediately went back up again - a pattern I got used to! 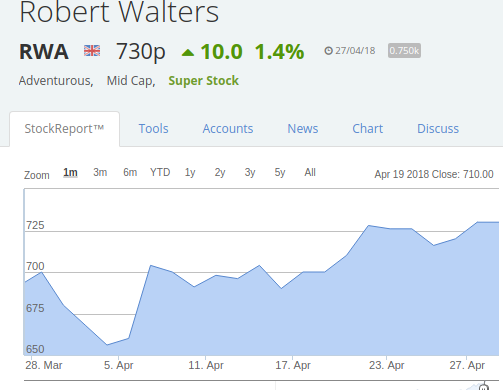 Robert Walters (LON:RWA) up nearly 10% from that dip below 665p.